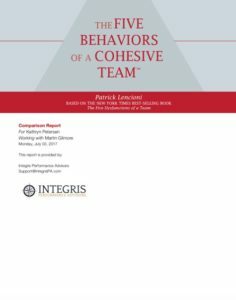 The Five Behaviors™ of a Cohesive Team™ Assessment is the one tool no team should be without. By having each team member answer a series of questions about the current state of the team and how the team can improve, this assessment will serve as the foundation for any team’s growth plan. Blended into the assessment results is a look at how team member personality styles and behavioral preferences shape the interaction of the team as a whole, providing meaningful insights that will help develop true team cohesion. The Five Behaviors™ Powered by Everything DiSC® Progress Report is for teams who have already taken the original The Five Behaviors™ Powered by Everything DiSC®assessment. It measures team progress by graphically comparing how a team’s performance changed over time. A 20-minute online assessment to be completed by each member of an intact team. Two areas of team performance: (1) How are we doing? and (2) What can we do to improve? Team dynamics are an important predictor of organizational health. Teams that work well together perform better. Download The Five Behaviors™ Powered by Everything DiSC® Progress Report. For teams who have already taken the original The Five Behaviors™ assessment—measures progress by graphically comparing how a team's performance changed over time.